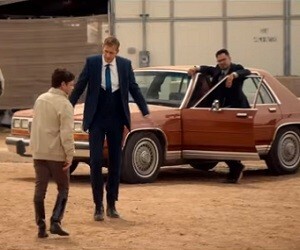 War on Everyone is a British crime comedy film following Bob and Terry, two corrupt cops who intend to blackmail and frame every criminal they meet. Things get spiced up, though, when they try to intimidate someone very dangerous. Directed by John Michael McDonagh, the movie stars Alexander Skarsgard and Michael Peña in the leading roles, Tessa Thompson, Theo James, Stephanie Sigman, Caleb Landry Jones, Malcolm Barrett, and Paul Reiser. The songs playing in the red band trailer are “Rhinestone Cowboy”, performed by the American rock and country music singer Glen Campbell, and “Ante Up (Robin Hoodz Theory)”, performed by the American hip hop duo M.O.P.